What Symptoms and Signs May Accompany Hair Loss? When Should Someone Seek Medical Care for Hair Loss? How Do Health-Care Professionals Assess and Diagnose Hair Loss? Are There Home Remedies for Hair Loss? When Is Surgery Appropriate for Hair Loss? Is Follow-up Necessary After Treatment of Hair Loss? What Is the Prognosis of Hair Loss? Physicians divide cosmetically significant hair loss into two categories. Each person sheds hair and regrows hair every day. When this balance is disturbed and more hairs are shed than are regrown, alopecia or hair loss results. Female-pattern baldness is very similar to its male counterpart, it occurs after menopause, and often spares the frontal hairline. It usually involves an overall thinning of hair. Telogen effluvium is a phenomenon that occurs mostly in females, especially post pregnancy when there is an entirely, spontaneously reversible shedding of scalp hair. Most people notice hair loss when looking at themselves in a mirror or when it is brought to their attention by others. You may also find many hairs on your pillow in the morning or in your hairbrush or comb. A woman may notice a decrease in the size of her ponytail or the widening of her part. If you have hair loss, you may want to see a doctor to evaluate if there are any medical reasons for the hair loss and to evaluate if any therapies are available for you. See your doctor if you are losing large amounts of hair every day and if you are not feeling well at the same time you are losing hair. Most often hair loss occurs without other signs of illness. If the following symptoms occur at the same time as hair loss, you may have a serious medical condition and you should see a doctor right away. There is no reason to seek emergency medical care for hair loss. Charts with pictures of hair loss help to classify the amount and type of hair loss. These include the Hamilton and Ludwig classification charts. Extra tests may be necessary if the diagnosis is uncertain, especially if you have symptoms besides hair loss. A hair pull test can be performed to examine multiple hair shafts microscopically for thickness, length, structure, and growth phase and to determine if abnormal number of hairs are falling out. Different thickness and length occurs in the most common type of hair loss, androgenic alopecia. Skin problems leading to hair loss may be diagnosed by taking a sample of skin and hair from the affected area. A doctor looking at this under a microscope might find a specific cause. If hair loss is severe or other signs of illness are present, your health-care provider may order specific tests, including X-rays and blood tests. If hair loss is caused by an illness, treatment of the illness is the best treatment for hair loss. The decision to treat androgenetic alopecia depends upon its emotional effect on the patient's sense of well-being. Many different therapies to stop hair loss and to regrow hair are promoted; you should discuss these options with your physician to establish their validity. Treatment options for androgenetic alopecia include grooming techniques, wigs and hairpieces, medications, and surgery. Styling hair to cover the areas with the most hair loss is effective for mild cases. Washing and styling the hair will not cause further hair loss. Treatment of this problem at home is difficult. Decreasing the amount of pulling, tugging, and tension on the hair can prevent damage to the hair follicle and shaft. Most people will need to see their doctor to determine if there is a medical problem causing hair loss and to consider if treatment is indicated. A wide variety of nonprescription products and services are offered for hair loss. You should discuss them with your physician before initiating any therapies, especially if you are on medications or have chronic illnesses. Minoxidil (Rogaine, Loniten): A medication you rub directly onto your scalp. This medication enlarges hairs and makes them grow for a longer period. It works for both men and women some of the time. It works best for balding at the top and back of the head and less well for the front area of the scalp. Stopping this medication can result in loss of the hair that developed during its use. Intralesional injection of steroids directly into the areas of involved skin can promote hair growth in treated areas. This procedure, if performed by an expert, can produce a natural-appearing hairline but hair plugs placed by the neophyte can have a bothersome checkerboard appearance. Follicular transplants, which move individual hairs units from one place to another, are replacing hair-plug transplants. During treatment for hair loss, you can expect to return to the doctor periodically to determine the response to treatment and to monitor for side effects from the medications being used. The ability to stop hair loss most often depends on the underlying cause. If taking a certain medication is the cause, stopping the medication should stop the hair loss. The best prevention of hair loss is early treatment. Research has shown that minoxidil is most useful for people who have been losing hair for less than five years. A doctor who can help determine if the medications are working and who can watch for side effects of the medications should follow up with people who are being treated with minoxidil or finasteride. 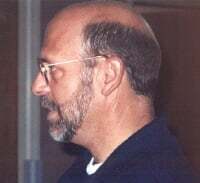 This man demonstrates typical male-pattern baldness. Notice that the side and back regions are least affected. 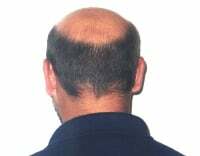 This is a typical view of male-pattern baldness from the back. This man has mostly frontal balding. Early treatment is the only prevention of further hair loss. Hair loss doesn't only happen to men. There are a variety of causes of hair loss in women, including hormone problems, childbirth, PCOS, alopecia areata, and ringworm, among others. See pictures of other causes of women's hair loss, and learn about treatments for thinning hair. Ahanogbe, Isabella, and Alde Carlo P. Gavino. "Evaluation and Management of the Hair Loss Patient in the Primary Care Setting." Prim Care Clin Offic Pract 2015: 1-21. Rogers, Nicole E. "Medical Treatments for Male and Female Pattern Hair Loss." J Am Acad Dermatol 59.4 Oct. 2008: 547-566. Stefanato, C.M. "Histopathology of Alopecia: A Clinicopathological Approach to Diagnosis." Histopathology 56.1 Jan. 2010: 24-38. Please describe the cause of your hair loss. What hair loss home remedies have you tried?